As Office 365 has matured over the years, Microsoft has been enabling more and more power of self–service to end users. This means that the Governance of your Digital Workplace is easier. More and more options are now possible for automation of the provisioning in Office 365 of Digital Workplace assets. Depending on what side of the fence you land on this, the possibilities may excite you, or keep you up at night. If you have excitement, this may likely stems from how much value your users get in being able to easily create a Microsoft Team, a SharePoint Site or a Yammer Group or maybe even all of them. Additionally, you are probably basking in the feeling of how you can do more with less now. No longer is a support person needed to create these assets based on requests from your users. As long as there are good training resources available, your users shouldn’t need you for this sort of mundane sort of work anymore and it turns into work that you are happy to no longer do... and it all feels too good to be true. … Well, buzz kill, it probably is. If you are one where all that friction free self-service keeps you up at night, you are probably already thinking all the questions that come to my mind. ..control what type of collaboration goes where? ..stay compliant to regulations that are required for our industry? ..keep content relevant and remove content no longer in use? ..enforce any meaningful naming, templating or security standards? The questions could keep going on and on but hopefully, you get my point. Without you (IT) being involved in the creation process, you could be trying to maintain a healthy service, but having to be more reactive vs. proactive. Being reactive can be quite inefficient, but you don’t want to get in the way for people that need collaboration services. 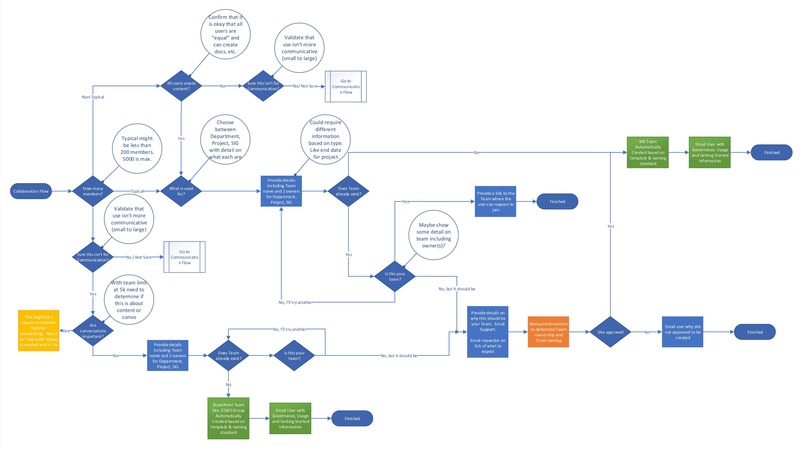 You can provide a simple form that guides your users through the request process. 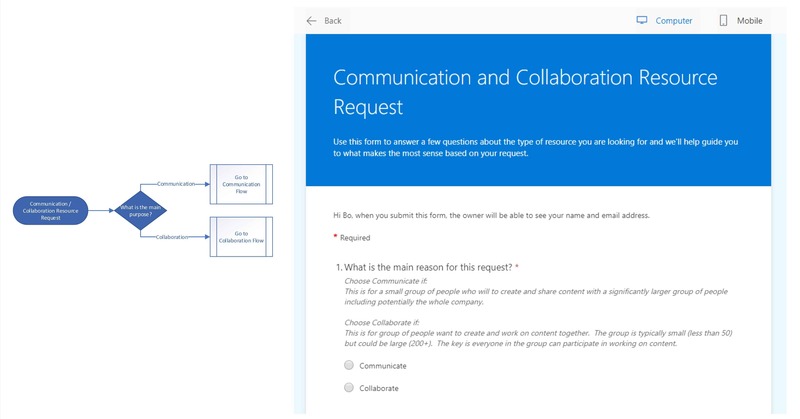 They may not know if they want a Team, Yammer Group or SharePoint Communication site. Your form can help them figure that all out from a single centralized place. Capture all the necessary information in the request form to better understand what your users are doing. Are they creating Teams for managing projects, departments? Are they creating Communication sites for Marketing or Yammer Groups for corporate conversations? Prescribe templates and create assets using them without requiring your team to be involved. Set up dispositions based on the type of asset or request. For example, Project Teams need to be renewed every 6 months and Department Teams every year. Maybe Communication Sites are every 2 years. Educate users during the request with additional governance related information and provisioning in Office 365 even more as part of the asset. For example, informing them not to upload sensitive PII information. Obviously, Office 365 compliance center can check for these things too but managing your user’s expectations up front ensures when they violate a policy you know they’ve been educated before. Additionally, how much you use this request form data to automate is entirely up to you and can grow over time. Initially, the workflow could be frictionless and simply provision the requested assets, being updated through post provisioning. As your process and governance evolve and mature you can do more and more with the data you’ve captured in terms of automation and reporting. Below are some examples of how provisioning in Office 365 workflow might look and flow. They are purposely generic but intended to show how decisions in a request can affect a flow and ultimately guide a user down the paths you want to prescribe to them. 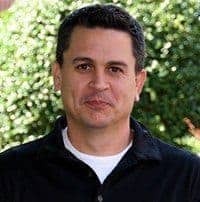 Overall, I hope you have a better sense of why automating the provisioning in Office 365 of Digital Workplace assets (SharePoint, Yammer, Teams, etc.) can be good for IT and for end users. At ThreeWill, we are very passionate about helping organizations figure out how to create the appropriate balance between enabling end users while having control over your Digital Workplace. Please contact us if you need help in with automating your provisioning. If you want to read up on the topic of digital workplaces, here is our Ultimate Guide to Office 365 Digital Workplaces. This is an area where we have lots of passion and can make a big impact on keeping a healthy Digital Workplace.